Everyone knows Napa Valley makes great Cabernet Sauvignon. But now exciting cabs are arriving from the “other” California, like Santa Barbara’s Happy Canyon region and Lake County’s obsidian-strewn hills. Here, a guide to the state's lesser-known wine regions. Santa Barbara made its name with Pinot Noir, but don’t ignore this Central Coast region’s structured Cabernets. The best tend to come from two new appellations, Ballard Canyon and Happy Canyon, in the warmer inland parts of the county. Santa Barbara’s first estate winery is located in the Santa Ynez Valley, where cool nights give Cabernet ideal focus. This entry-level wine is a good example of the regional style. 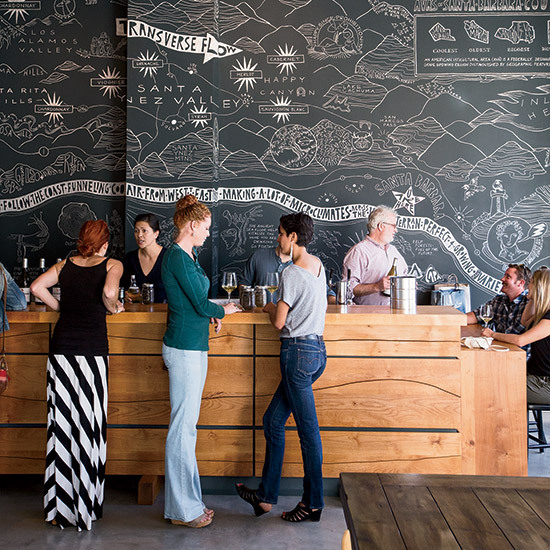 At winemaker Seth Kunin’s The Valley Project tasting room in Santa Barbara’s Funk District, visitors can sample wines from every appellation in the county, including this tangy Cabernet. Happy Canyon, the sub-region of Santa Barbara county that produced this palate-gripping red, was known as a source for good moonshine during Prohibition (hence the name); today it’s known as the source for most of the top Cabernets in the Santa Barbara region. Grassini’s Happy Canyon winery is remotely situated, but the winery also has a Santa Barbara tasting room, where this complex, full-bodied Cabernet is poured. Another Happy Canyon producer, the Westerly property was originally a 3,900-acre horse ranch. Today it produces a range of impressive reds, among them this chewy, black currant-rich Cabernet. Sonoma County is sometimes overshadowed by neighboring Cabernet superstar Napa Valley, yet some of the state’s best Cabernets are made here. Sonoma is big, with more than a million acres of land, so finding the best Cabernet requires seeking out the warmer sub-appellations where it thrives. (Typically, those are inland, out of reach of the cold Pacific fog.) The wines tend to be less voluptuous than their Napa counterparts, with a lively acidity that makes them especially versatile with food. An affordable Cabernet from Sonoma’s oldest winery, this red is on the medium-bodied, elegant side, with an orange-peel note in the finish. Marc Mondavi’s family may be famous for helping define the wines of Napa Valley (he’s wine legend Robert Mondavi’s grandson), but he’s proved equally capable at working with Sonoma grapes, as this lively red shows. Knights Valley, Sonoma’s warmest subregion, was a private hunting preserve back in the 1800s. Cabernets here tend towards the rich and luscious, like this bottling from Napa-based Beringer. In Sonoma as in most wine regions, as you go up in altitude, the weather cools down. Combine that with the thin, volcanic soil on Sonoma Mountain and the result is structured, long-aging Cabernets like this one from Laurel Glen. Several vineyards along a ridge in the Mayacamas Mountains provide the fruit for this aromatic Cabernet; it’s both earthy and full of intense blackberry-cassis notes, and will only get more complex as it ages. Up until a few years ago, Lake County’s main claim to fame was bass fishing on Clear Lake, which ESPN once named the second-greatest bass-fishing lake in the country (Lake Amistad in Texas beat it out). But, more important for wine lovers, the extinct volcanoes that ring the lake offer iron-rich soil that is ideal for Cabernet. Lake County Cabernets, especially from the Red Hills and High Valley appellations, tend to be concentrated, often with a distinct mineral edge. Cabernet this good made from low-yielding, 40-year-old vines, as this one is, would normally run twice this price. A flock of 1,100 sheep help crop weeds from the vineyards that produce this generously dark-fruited Cabernet. A ringer for a $100 Napa wine, this rich red comes from a vineyard strewn with obsidian pieces ranging in size from pebbles to boulders. An unusually high percentage of Petite Verdot (often blended with Cabernet) gives it a distinctive spice note. Still fairly young and formidable, even five years after the vintage, this impressive Cabernet comes from an organically and biodynamically farmed vineyard in the Red Hills AVA of Lake County. Paso Robles is famous as a source for big, bold, rich Zinfandels, wines supercharged by the region’s seemingly inexhaustible warmth and sunlight. But the truth is that Paso Robles, which is located between Monterey and Santa Barbara, inland from the Pacific Coast, has more Cabernet Sauvignon planted than any other wine grape variety. These aren’t shy wines: Paso Robles Cabernets exemplify richness, often showing notes of ripe blackberry and plum, soft tannins and plenty of concentration. This bottling is a great introduction to the Paso style—dark, plummy and lush—and, despite the name, it isn’t overly oaky either. Justin Baldwin, a Paso Robles pioneer, started his winery in 1981 with a focus on classically styled, graphite-scented Cabernets like this one. The cool 2011 summer kept the fruit in this lively Cabernet on the red side—think red currants and raspberries—rather than the black fruit more typical of Paso Robles. A good percentage of Cabernet Franc (25%) adds a leafy spice note to the aroma, too. The grapes for this black currant-inflected Cabernet come from a single, 17-acre vineyard that Gary Eberle, one of the pioneers of the Paso Robles region when it comes to wine, planted back in 1979. This intense, full-bodied Cabernet from Lebanese-French brothers Daniel and Georges Daou shows the strengths of the superb 2012 vintage. Winemaker Stephan Asseo worked for 17 years at various French estates before deciding he’d had enough with the wine regulations there. He and his wife Beatrice decamped to the Paso Robles area, where he now makes some of the region’s most sought-after reds. This Cabernet shows why: Incredibly rich and mouthfilling, at the same time it’s ideally balanced, with loads of cassis fruit and hints of black pepper.